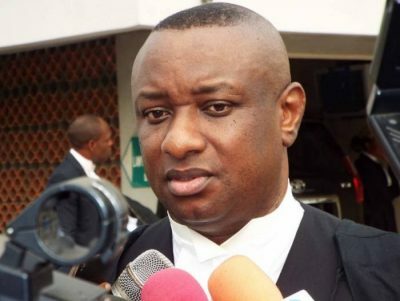 Festus Keyamo, spokesman of the reelection campaign of President Muhammadu Buhari, says Nigerians should be worried about the credibility of Atiku Abubakar, presidential candidate of the Peoples Democratic Party (PDP). In a statement on Sunday, Keyamo said Abubakar did not win the election on a free and fair basis but induced the delegates financially. “We wish to congratulate His Excellency, Alhaji Atiku Abubakar on his emergence as the candidate of the PDP in respect of the forth-coming 2019 Presidential Election,” the statement read. He recalled how Abubakar had also been accused of vote-buying during the 2014 All Progressives Congress (APC) convention, saying the PDP presidential aspirant never denied the reports. “There were also media reports in the 2014 APC National Convention that Alhaji Atiku Abubakar freely used the same method of massive vote-buying in foreign currency, but he came a distant third. Till date, he has not denied those media reports,” he said. “The claim therefore that the process that produce him now as a candidate of the PDP was free, fair and transparent is suspect. Madness is on it way to u. Is the country ok with the look of things. Anyway, Buhari is it pay master genaral.